Update: The Government was sworn on Monday. See photo below. As speculated after the elections in Israel last January, one-year-old center party Yesh Atid (19 Knesset seats) and rising right-wing party HaBait HaYehudi (12 seats) signed today coalitional agreements with HaLikud (31 seats in a list shared with the Israel Beytenu party), that had also reached an agreement with new center party HaTnuah (6 seats) earlier. HaLikud leader Benjamin Netanyahu will remain Prime minister — for the third time — and will also be Foreign Minister until the end of Israel Beytenu leader Avigdor Lieberman’s ongoing court hearing. Yesh atid Leader Yair Lapid will be Finance Minister, while Habait Hayehudi leader Naftali Bennett will be “Economy and Trade” Minister. Hatnuah leader Tzipi Livni will be Justice Minister and will also be responsibe for the negotiations with the Palestinians. With 68 of the 120 Knesset seats, it will be one of the only Israeli governments to have not contained religious parties (although Bennett himself is an Orthodox), due to differences with Yesh Atid about recuiting yeshiva students to the IDF. Also due to Yair Lapid’s pressure, it will be one of the smallest governments in Israel’s history, with 20 Ministers, in contrast to the current one, which started out with 30. Election Day in Israel was declared a national holiday and the weather was gorgeous. The public voted and then most of us went to the beach, to cafes, or shopping for the rest of the “day off”. It was a delightful, very Israeli experience. Everyone seemed happy and up about being who and what we are. In the morning we found that we’ve handed our politicians a classic Israeli post-election dilemma. It feels so very Israeli and nostalgic that I did today’s cartoon in Blue and White. Update: after counting all votes, including all IDF soldeirs, Habait Hayehudi got another seat and went up to 12 on the expense of Raam-Taal, that went down to 4. See full table below. 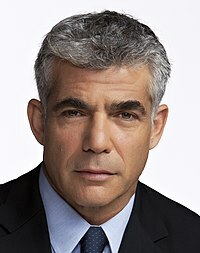 After counting 99.8% of Israel general elections votes, Yesh Atid, former journalist Yair Lapid’s one-year-old party, gets 19 seats in the Knesset. The unification of HaLikud and Israel Beytenu gets 31. HaAvoda gets 15 seats, two less than expected in TV channel samples. Right party HaBait HaYehudi gets 11 seats, like orthodox party Shas. Religious party Yahaduth HaTorah gets 7 seats. Center-left party HaTnuah and left party Meretz get 6 seats each. Ultra-left party Hadash gets 4 seats, while Arab parties Raam-Taal and Balad get 5 and 3 seats respectively. Kadima, largest party in current Knesset that was eliminated in TV samples, eventually enters the Knesset with 2.09% of all votes (2% is required to enter), and 2 seats. HaAvoda had announced that it will not join a coalition headed by HaLikud. Assuming Halikud leader and current Prime Minister Benjamin Netanyahu will get to build a coalition, his partners are likely to be Yesh Atid, HaBait HaYehudi and Hatnuah (67 of 120 seats total). There is also a risky possibility of having a coalition with Shas, Habait HaYehudi and Yahaduth HaTorah (60 seats). Netanyahu will speak with the leaders of all mentioned parties trying to form a 85-seat coalition, but it is not likely to happen. If Netanyahu fails to form a coalition, Lapid will get the opportunity to do so, but only if he reaches agreements with all HaAvoda, Shas, Yahaduth Hatorah, Hatnuah and Meretz (64 seats total). 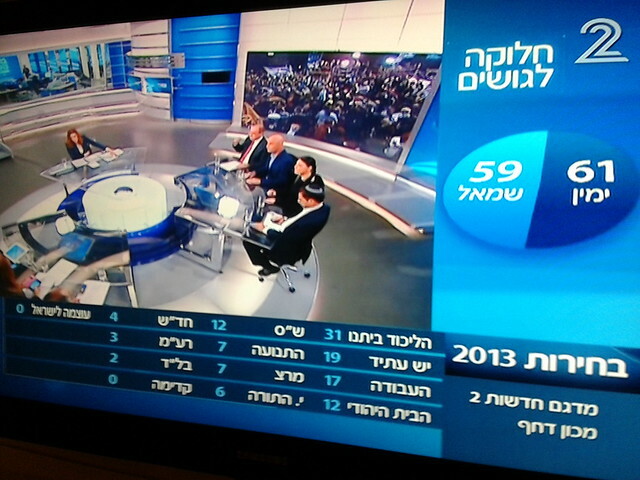 The big three Israeli TV channels are in agreement: the right-wing and religious parties will hold a bare majority with 61 seats in the 120 member Knesset while the Arab and left-wing parties will hold the remaining 59 seats. Yesh Atid (There is a Future), the one-year-old party of Yair Lapid (shown on the right), former journalist and son of the late Deputy Prime Minister Tommy Lapid, gets 19 of the 120 Knesset seats after the Israel general elections held today. The list-unification of current Prime Minister Benjamin Netanyahu’s HaLikud (The Unity) and Avigdor Liberman’s Yisrael Beytenu (Israel Our Home) has weakened both parties, which got together 31 seats: by the pre-agreement of both parties, 21 will go for HaLikud (currently 27) and 10 for Yisrael Beytenu (currently 15). HaAvoda (The Labor), traditionally Israel’s biggest left party, is expected to get 17 seats. Habait Hayehudi (The Jewish Home, currently 3 seats) gets 12 seats having gained voters from the failing Halikud-Beytenu merge. Orthodox party Shas (Shomrey Sfarad, Sfarad Guards) retains it’s 11 seats. HaTnuah (The Movement), former Kadima (Forward) leader Tzipi Livni’s new party, gets 7 seats, like left party Meretz, which currently has only 3. Yahaduth HaTorah (Torah’s Judaism) gets 6 seats. Ultra-left party Hadash gets 4 seats, like Arab party Raam-Taal. Another Arab party, Balad, expects to enter the Knesset with 2 seats (the minimum possible as 2% of all votes is required to enter). Meanwhile, three parties Otzma LeIsrael, Am Shalem and Kadima, largest party in current Knesset (28 seats) are all expected to be eliminated. Atzmaut (Independence) has not participated in the elections after its leader, current Defense Minister Ehud Barak, had decided to retire from the Knesset after current seat. 66.6% of eligible voters have voted today.